Andre and I left Santa Cruz in the early afternoon. We made many stops along the way, starting with the J&S Surplus and Outdoor Store in Moss Landing. Andre's grandfather who raised him was a soldier and Andre has always dreamed of being in the military, so I knew he'd enjoy their huge collection. 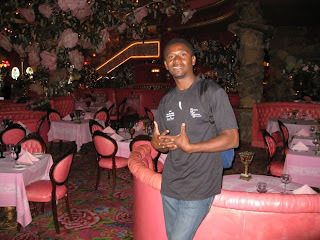 Next we stopped in San Luis Obispo and checked out the Madonna Inn. It used to be painted hot pink and seemed much more kitschy in the past, but it's still fun. He got to see the waterfall urinal in the wine cellar men's room. I've seen it before, but there were too many tourists that day. We got off the road in Pismo Beach, looking for food, and went a route I'd never been before. I believe in doing new things every day, so I don't mind getting lost. We ended up in a town called Oceano and found a fun 50s-style hamburger joint made out of two dining cars parked on railroad tracks. They were playing great old-time rock and roll and I showed a bemused Andre how to do the twist. Even though it was getting later than I'd hoped by the time we found our way back to 101 South, I still wanted to stop in Solvang, a Danish town which Maya and Daniel always enjoyed. 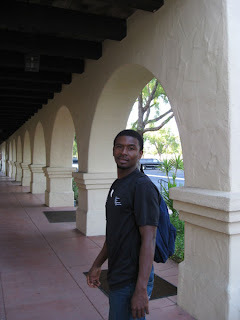 We walked around Mission Santa Ynez and a bit of downtown, but mostly everything was closed. We spent another $55 to fill up the tank on my 1987 Nissan Maxima. It takes two tanks to arrive in San Diego. I can see why fewer Americans are traveling than before, even though by world standards our gasoline is still cheap. We called our friends Sally and John Richards in Ventura and warned them we'd be arriving a little later than 8:30 p.m. My Oma and I met this wonderful couple on our way to India in 1988. John recently became the oldest person to win a Sprint Car race at age 76. Not that long ago, they made a motorcycle trip from Alaska to the tip of South America. John owns an antique open-cockpit plane, which he took my Oma up in for a thrill. He did loopty-loops with her. Sally, at 76, is in fabulous shape, thanks to pilates, swimming, walking, and yoga. Our guest room was ready for us. PHOTO CAPTIONS: 1. 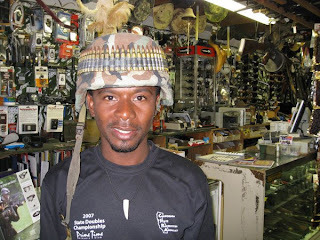 Military surplus store in Moss Landing, 2. Madonna Inn in San Luis Obispo, 3. 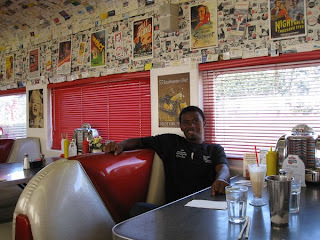 Rock 'N Roll diner in Oceano, 4 & 5. 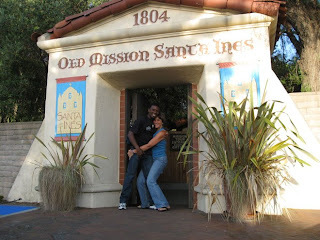 Mission in Solvang. 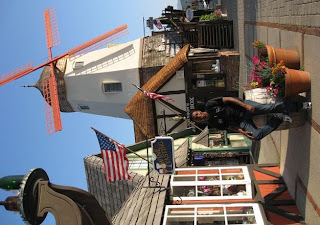 6. downtown Solvang.